I want to present you with a great tool that I have been using for a while now. It is called Weinlagen Info, and gives you a chance to see exactly where the grapes in the bottle that you are drinking come from. This is because a lot of wine labels tell you quite exactly where the grapes for the wine were grown and harvested. Take for example a German wine label. As soon as you go for wines above table wine, the label will tell you the village and vineyard that the grapes were grown. If you are not familiar with labels, that can be quite confusing. But once you figured out that the word that ends in “-er” stands for the village and the following word for the vineyard, things get easier. For example, “Erdener Prälat” comes from the village Erden, and the vineyard is the famous Prälat. The same is true for all other village denominations in German, like “Nackenheimer Rothenberg”, the vineyard Rothenberg in my hometown Nackenheim. So, please, when talking about the village, drop the “-er”. I superficially checked the content for Austria, France, Italy, Hungary, the US (! ), and Spain, the other countries in the database, but the content is still very limited, so for now it is best as a German vineyard resource. Right now, it is only available in German, but it is pretty straightforward because of its drop down menus. It begins with Country, Area, District, Town, and that followed by vineyard. My Google Translate did a decent job of translating that into English…It also has a search function which makes things even easier! Thanks for posting this tool! Although it is still sparse in as far as information (as stated), it does have an interesting interface. Always good to practice German…lol. Thanks for stopping by. Thanks for making me aware of this tool. Ich habe ein Problem: Ich spreche nicht deutsch! A very cool site, nonetheless! But like I said, it is pretty easy to figure out when you have the label in front of you. My automatic google translate for the page was quite accurate. That is soooooo cool! THanks for sharing! Ha, turns out I am not the only nerd here, huh? 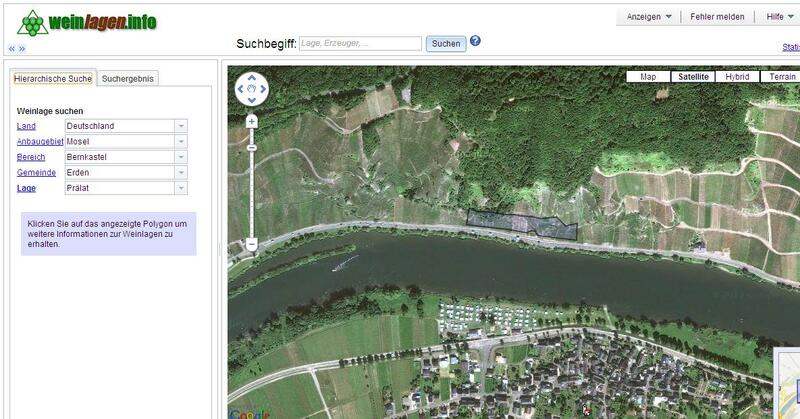 Very cool site and thanks for decoding German WIne Labels, they can be tricky. I am still planning to write a proper decoding labels post in the future. It’s fun playing around with it!